I really enjoy children's literature because I am an aspiring special education teacher. I love classical children's literature, as well as more modern literature! 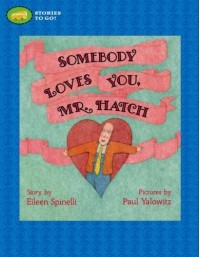 Valentines Day "Somebody Loves You, Mr. Hatch"
Somebody Loves You, Mr. Hatch written by Eileen Spinelli and illustrated by Paul Yalowitz is the prefect book to read in February in relation to Valentines Day. This touching story is about a man, Mr. Hatch, in the community who keeps to himself most days. Until, he receives a valentine from a secret admirer. Mr. Hatch begins talking to everyone keeping in the back of his mind that he wants to find this admirer. He becomes more outgoing and helps everyone in the community. This continues until the postman brings to Mr. Hatch's attention, that he made a mistake and delivered the valentine to the wrong address. To find out what the community does next, you'll just have to read for yourself because this book is truly heart wrenching. I see myself using this book in my classroom before our Valentines Day party. This would encourage all students to put thought into their valentine, because even a few kind words can change a person's life. We could do a sequencing activity with this text or write a letter to Mr. Hatch to accompany this book. This story is a 3.9 on the accelerated reader leveling system.